In 2013 the Supreme Court effectively gutted many of the protections inherent in the 1965 Voting Rights Act. As a result states are finding new ways to stop more and more people—especially African Americans, low income Americans, and young people—from reaching the polls. But there are some straightforward steps we can take that would protect everyone’s access to the polls. 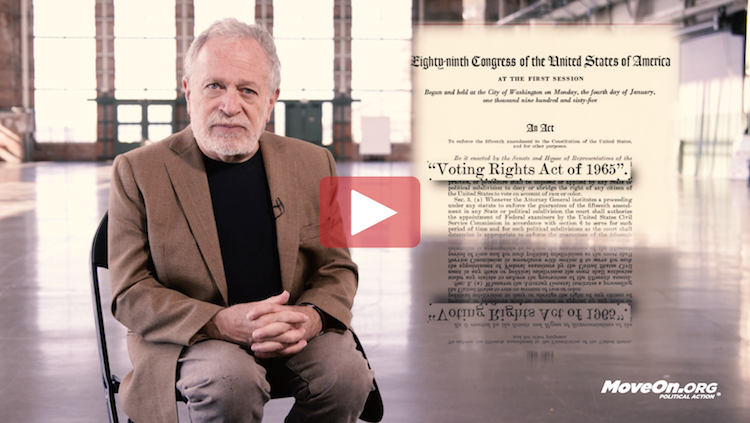 Will you take three minutes to watch my latest video with MoveOn, Voter Suppression (and how it works)? And please share it with your family and friends. Voting rights are too important to be left to partisan politics. We must not allow anyone’s vote to be taken away. Thanks for watching and sharing Voter Suppression (and how it works). And thanks for all you do.